Cow has a sharp sixth sense. As per an epic story, the cow could once talk. It predicted an impending accident to its master and helped him avoid it. The God then made the cow dumb for changing what was destined. Cows respond to the joy and suffering of people. There are many examples of cows shedding tears and even refusing food empathising with their masters. 1. Lathur in Maharashtra had a devastating earthquake on 30 September 1993. Devani breed of cows in that place had been behaving strange, crying and jumping around a few days before this as a warning to the people. We could not decipher the message. 2. Similar things happened before Tsunami in 2004 too. 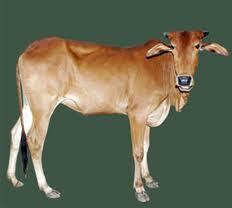 Then, Baraguru, Amblacheri and Kangayam breed of cows behaved strangely. We could not get the message again.